Filling your home with beautiful plants can create a serene and peaceful aura, but if you have a cat, these peaceful plants can become extremely harmful. There are many plants that are toxic to your cat, but listed below are the top seven common house plants. The best thing you can do is to avoid bringing these plants into your home. However, that doesn’t mean that your cat still won’t accidentally stumble upon some and eat it. In case this happens, you need to be aware of the symptoms and signs that your cat is experiencing plant poisoning so you can seek help for them immediately. Knowing which plant they have ingested is also extremely important in allowing your cat to have a successful recovery. Because there are so many plants that are harmful to cats, you can’t trust just anyone with your cat’s care while you are away. Hire a professional cat sitter as they highly trained in the plants and their effects they can have on cats. You can trust them in your absence to keep your cat healthy and safe. The asparagus fern is toxic to cats. It is also called an emerald feather, emerald fern, sprengeri fern, plumosa fern, or lace fern. The reason this plant is poisonous to cats is that it contains a toxic agent known as a sapogenin. Sapogenin is a steroid that is found in a variety of plants and if ingested, it can cause your cat to experience vomiting, diarrhea and/or abdominal pain. Allergic dermatitis or skin inflammation can also occur if your cat is repeatedly exposed. White lilies are a beautiful flower, but they are toxic to cats. 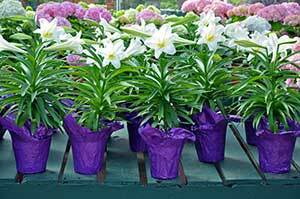 Many plants of the lily family are actually toxic to cats, including the Easter, stargazer, and Mauna Loa lilies. Often times, a cat’s first reaction to this plant is going to include vomiting, lethargy, and lack of appetite. If this is left untreated, kidney failure and even death can quickly follow. Ingestion of the peace lily or calla lily can cause your cat to experience irritation of the tongue and lips, increased salivation, difficulty swallowing, and vomiting. Aloe can offer many healing properties for humans, but for cats, it is a poisonous plant. 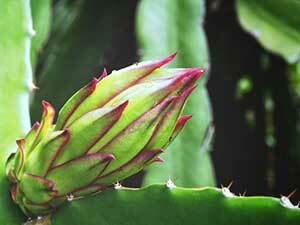 Aloe plants can also be known as medicine plant or Barbados aloe. The reason also is toxic to cats is because it contains the toxic agent aloin. Aloin is a bitter yellow substance that is found in most aloe species, and if your cat is exposed to it, your cat may experience vomiting and/or red urine. The jade plant is another plant that is poisonous to cats. The jade plant also goes by the names baby jade, dwarf rubber plant, jade tree, Chinese rubber plant, Japanese rubber plant, and friendship tree. What makes this plant toxic to cats is currently unknown, but if it is ingested it can cause vomiting, depression, ataxia (incoordination), and bradycardia (slow heart rate). The corn plant is known to be toxic to cats. It also can be referred to as cornstalk plant, dracaena, dragon tree, or ribbon plant. Saponin is the toxic agent that is found in this plant. If your cat ingests it, they may experience vomiting with or without blood, appetite loss, depression, dilated pupils and/or increased salivation. Cyclamen, or sowbread, is another flowering plant that is beautiful but can be very harmful to cats. If this plant is ingested it can cause increased salivation, vomiting, and diarrhea. If your cat injects a large number of the plant’s tubers (which are found at the root, generally below the soil), heart rhythm abnormalities, seizures, and even death can occur. Heartleaf Philodendron is a common houseplant that is easy-to-grow. This plant also goes by the names horsehead philodendron, cordatum, fiddle leaf, panda plant, split-leaf philodendron, fruit salad plant, red emerald, red princess, or saddle leaf. The toxic agent in this plant can cause your cat to experience irritation of the mouth, tongue, and lips. Other symptoms can include increased salivation, vomiting, and difficulty swallowing. Though only the top seven houseplants that are poisonous to cats is listed above, the reality is that there are many other plants that are toxic to your cat. The most common symptoms that your cat has ingested a toxic plant are redness, swelling, and itchiness of the skin and mouth. However, some toxic plants can directly affect particular organs, so you need to keep an eye on the following symptoms as well; your cat will have difficulty breathing if it’s airways are affected; drooling or difficulty swallowing if the mouth, throat, or esophagus is affected, vomiting if the stomach or intestines are affected, diarrhea is the intestines or colon are affected, excessive drinking and urinating if the kidneys are affected; fast, slow, or irregular heartbeat if the heart is affected. If you suspect your cat has ingested a poisonous houseplant, acting quickly is the best thing you can do. Your first step should be to remove any plant material from the hair and skin to help ensure that further irritation does not occur. If it is necessary, wash your cat with some warm water and non-irritating dish soap to fully cleanse their skin of the toxin. Then, you should take your cat to the veterinarian immediately. 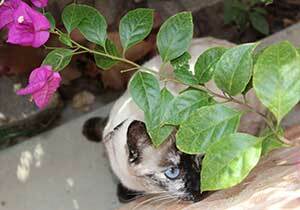 A big part of your cat’s treatment is going to depend on what kind of plant they ingested. If you are unsure of what the plant is, bring a sample of it with you to the vet. If you cannot locate the plant and your cat has vomited, bring a sample of that with you. Every effort should be made to identify the plant that was consumed because it can drastically help with making the treatment more effective. If you have to go out of town, be sure to trust the care of your cat to a professional cat sitter who has had special training to deal with situations like this.